A lenticular substrate is a translucent plastic sheet with a set of small convex lenses ( lenticules ) on one side and a flat surface on the other side. See picture below. It is the small convex lenses that transform a 2D image into special 3D visual illusions. One can see lenticular special effects when the viewing angle of a lenticular lens is changed, by either moving the lenses in one’s hands or moving around it when mounted on a wall or display. While lens resolution are available from 10 LPI up to 200 LPI, we will expand on the resolution of lenses in a different article in the near future. This article deals with lens angles and currently, 2 types of lenticular lenses are available and they offer a better performance for a specific 3D or animation project. As a rule of thumb, lenses are extruded at approximately 25 degrees for 3D work and approximately 50 degrees for a smooth flip & animation. 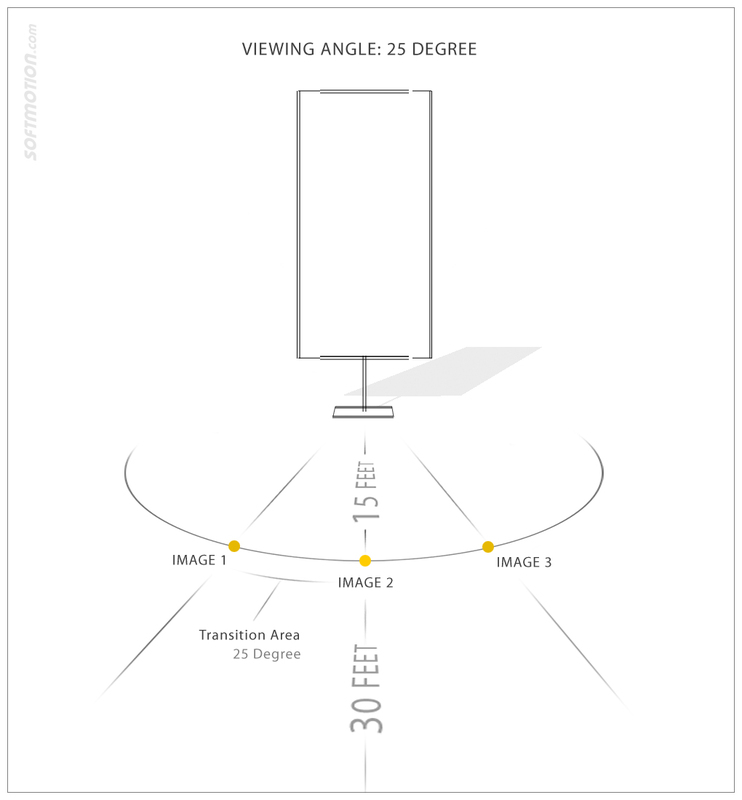 - When looking at the 25 degrees lens illustration below, we should see that if we select that lens, which is designed for 3D applications, we can still use it for a flip 2 or 3 phase project. At close range, the transition will be faster than a 50 degrees animation lens, but if one prefers a faster transition, depending on the image features to promote, that may do a better job than a wide angle selection. As well, if we move away from the work, the transition will be slower and offer a smoother rendering. In this condition, viewers will have to walk less time in the transition space and images will appear faster. If your viewers are 30 feet away from the image, you may not want them walking 15 feet in the transition space before seeing the next image. 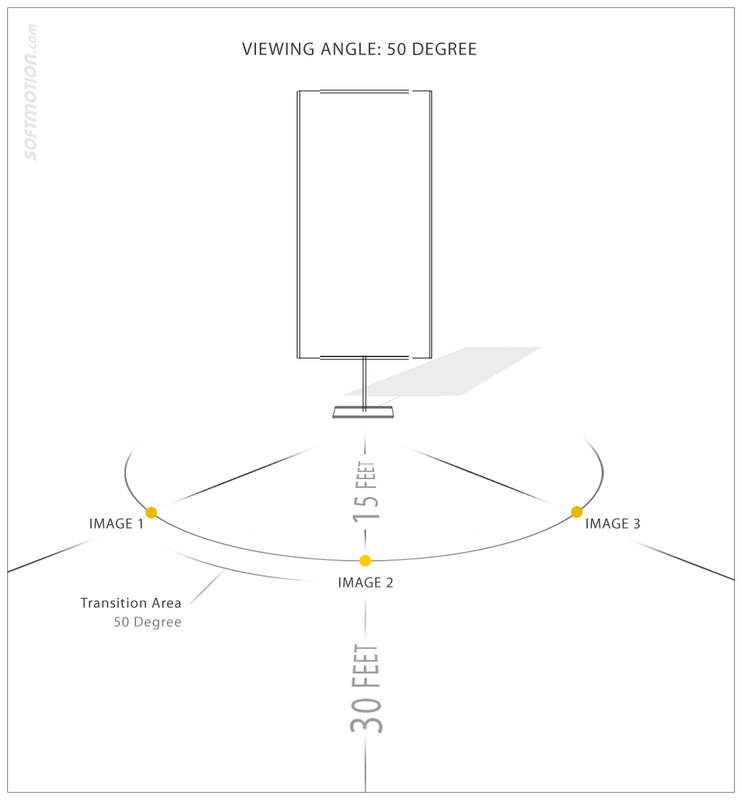 Vice versa when using a wide angle 50 degrees lens, designed for a smoother animation, but in a 3D application. This option will provide less 3D than a 25 degrees choice, since the lenticules are thinner and narrower. However, the transition of the 3D lens being faster, an image jump will occur more often and this may be annoying for certain people for certain subjects. 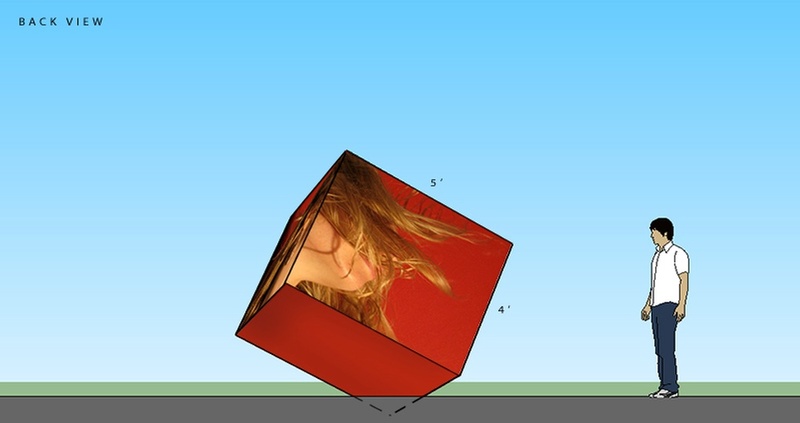 As an exemple, if the 3D subject is an object rotating like the images below, the viewing experience may be more confortable for several people. If time is on your side, you should find that experimentation is a good thing when creating lenticular art. We always recommend virtual and physical prototyping before signing off for final production, it will allow you to explore the possibility and provide a more rewarding lenticular experience. At Softmotion 3D, rest assured that we never accept any lenticular productions whithout providing our clients with a free feasibility study and prototyping at no cost.